2019 is when President Trump's tax reforms come into effect, and they will significantly change how you file. Adam Bruno, Founder/CEO of Evolution Retirement Services joined us to talk about what to expect. s the year comes to a close, we start thinking about the New Year! It’s a good time to start planning and thinking about your taxes. Financial professional Adam Bruno, President of Evolution Retirement Services, spoke with us about some things we can start doing now to prepare for tax time this spring. For many of us, tax time seems daunting. What are some basic things people can start doing to get ready so they aren’t pushing the deadline? First, get organized. It can be a good idea to get all your documents together now. Start gathering those forms – W2 forms, anything you might need to start the process, whether you file yourself or work with a tax professional. The new year can be a good time to sort through old papers and documents, and set aside what you might need. With the new tax law taking effect this year, what are some things people should know? Tax bracket rates have changed, and standard deductions have almost doubled, but personal exemptions have been eliminated. What that could potentially mean for you is, for instance, interest paid on new home equity loans may no longer be deductible. The new tax bill increased the child tax credit from $1000 to $2000 per child. The new tax reform law has now added a smaller, nonrefundable “family credit” for other dependents, like elderly parents or children over the age of 18. For every dependent, families are potentially entitled to a $500 credit. If you are planning on making any large gifts or donations, consider doing so before the year ends. A qualified charitable distribution is a good option for some individuals looking to minimize their taxable income. 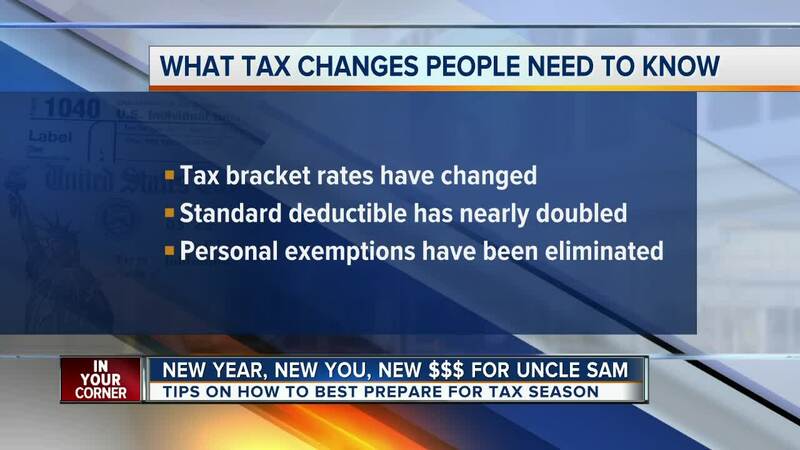 Are there any other changes or new deductions that may impact families in the US? There are several popular, small deductions that have been removed in the new tax law. For example, the deduction for alimony payments, moving expenses, and tax preparation have been removed by the Tax Cuts and Jobs Act. However, exemptions like the student loan interest deduction and the medical expenses deduction are still available. The 529 savings account can now be used to cover private elementary or secondary school expenses, up to $10,000. For parents who may have students enrolled in private school, this could mean they receive savings on their students’ tuition or other expenses.